There were many good shows on Tuesday with Vera Wang, Rodarte and Narcisso Rodriguez leading the pack. I’m absolutely wowed by Vera’s beautiful take on delicacy and sport. The fabrics, the colors, the silhouettes were all so modern and so fresh. She has really been killing it these past few seasons. I’m so impressed by her and I think she might be vying to become the NY fashion leader again like she was several years ago. But I was also equally enthusiastic about Narcisso Rodriguez’s collection. Narcisso hit it out of the park for Spring 2012 bringing me back to his early days when he wowed me with his minimalist modernism. The past several years he has been keeping it too safe for me, but this collection makes up for lost time. The color palette is so right for the season with his take on the Black and White trend popped with signature colors such as orange and ice blue. I love the cuts of his silhouettes with sharp lines and angles that produce a the perfect statement for the season. 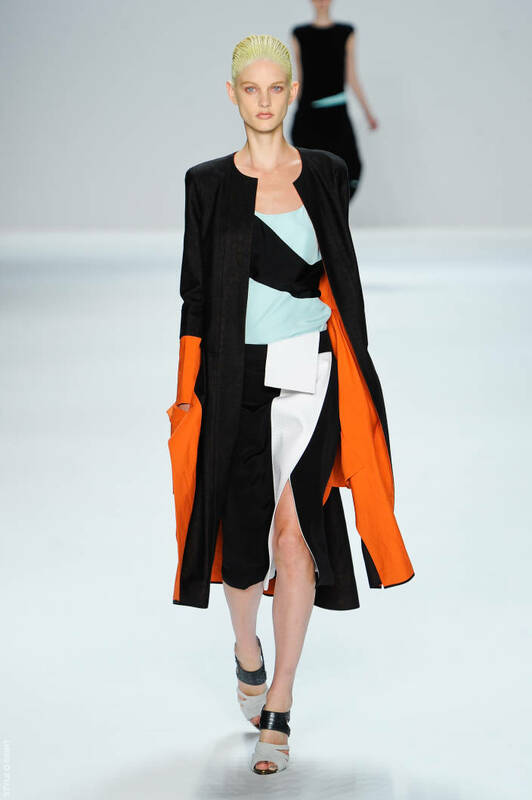 The way that this coat is color-blocked is smart and feels like something new for the season. If you have seen all of my choices in looks thus far, you might see a trend in separates happening. Apparently I’m feeling suiting….